Born and raised in Ohio, Jim Dine moved to New York in 1958 and established himself in the art world with theatrical Happenings performed in chaotic, artist-built environments. During that time, Dine began experimenting with assemblages and incorporating common objects into his paintings, drawings, and prints. In this tradition, he became one of the pioneers of Pop art. A natural reaction against the previous generation’s elevated aspirations for abstract expressionism, Pop artists often chose ordinary everyday objects as their subjects, presenting them with detachment and irony while adding an acceptance of the emblems of our consumer society and “low-brow” popular culture. Dine painted many images of bathrobes, neckties, hearts, and tools; some of his compositions incorporated actual objects, a decision that marked the beginning of Dine’s interest in sculpture. By the late 1960s, Dine turned his attention from the ordinary objects used during his brash Pop art days to ones that had increasing personal significance. His composition of objects on a table may refer to Alberto Giacometti’s (1901–1966) surrealist Table (1933), which features objects that refer to Giacometti's other sculptures. Dine’s History of Black Bronze updates that idea to the 1980s taste for art historical appropriation. He chose objects ranging from icons of classical art to the ordinary tools that became symbolic subjects for the artist, a resonance that stems from Dine's time working in his family’s hardware store. Dine’s choice of title and material make further reference to history, specifically the radical transformation of human society and art from the Stone Age to the Bronze Age. As an alloy consisting primarily of copper, bronze starts out as reddish gold and weathers to a bluish green or brown. To become black, bronze requires human intervention; for millennia, bronze casters had applied chemicals to create a black patina over the surface of bronze statues. The monochromatic surface and size uniformity of the objects on the table elevate the mundane hammer to the level of appreciation warranted by the classical Venus de Milo. After leaving Cincinnati for New York in 1958, Jim Dine became one of the pioneers of pop art. Pop artists often chose ordinary everyday objects as their subjects, presenting them with detachment and irony. In part, this was a natural reaction of young artists against the previous generation’s elevated aspirations for abstract expressionism in the 1940s and 1950s. Pop artists consciously developed the cynicism of Dada artists of the 1910s and 1920s (Marcel Duchamp, for example, made “art” from bicycle parts, a snow shovel, even a urinal) to express their rejection of bourgeois society and the concurrent enthusiasm for abstraction. To that background the Pop artists added an acceptance of the emblems of our consumer society and “low-brow” popular culture. Roy Lichtenstein appropriated images from comics; Andy Warhol painted images of Campbell’s soup cans and Brillo boxes; Jasper Johns favored flags and maps; and Robert Rauschenberg used almost anything from old tires and broken furniture to stuffed birds and electric lights. Dine painted many images of bathrobes, neckties, hearts, and tools; some compositions incorporated actual objects. Five Feet of Colorful Tools and Black Garden Tools (both 1962) each consisted of a nearly blank canvas surmounted by a row of painted hand tools (one in bright hues, the other in ominous black). This incorporation of real objects marked the beginning of Dine’s interest in sculpture, though he did not develop this tendency until a decade later when he settled his family on a farm in Vermont. The painting Our Life Here (1972) consisted of a row of utilitarian objects, including a penknife, gardening gloves, and a shaving brush. The ordinary objects from his brash pop art days had become personal, referring not only to his own lifestyle but to his family heritage: as a child he had grown up among the wares in his parents’ hardware store. History of Black Bronze I is best understood in the context of art in the 1980s, when many artists referred to and borrowed from historic sources in a process they called “appropriation.” Art became the subject of art. In format, Dine’s composition of objects on a table may refer to Alberto Giacometti’s surrealist Table (1933), which featured a partially veiled head, a horizontal hand, and a polyhedron on a table. 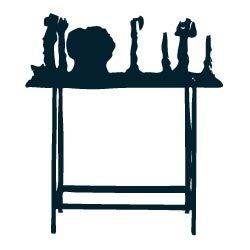 Giacometti’s array of objects referred to other sculptures he was working on at the time. Dine’s History of Black Bronze updated that idea to the 1980s taste for art historical appropriation. He chose objects ranging from icons of classical art to ordinary tools. On the left stands a reproduction of the Venus de Milo, one of the most admired sculptures of a goddess from ancient Greece and one of the major attractions in the Louvre Museum in Paris. Next to the statuette, an upward-reaching hand refers to the expressively modeled hands sculpted by Auguste Rodin in the late nineteenth century. The inspiration for the two adjoining heads is more difficult to pin down; perhaps an allusion to the expressionist heads sculpted by Giacometti in the last decades of his life. On the right, Dine appropriated the head of an Egyptian pharaoh, possibly that of Tutankhamen (a blockbuster exhibition devoted to Tut and his treasures had toured the U.S. in the late 1970s). Dine flanked that image with two hammers, as if to break up the aura of hype and commercialization surrounding King Tut. The tools also refer to Dine’s own paintings of such mundane objects. Dine’s choice of title and material make further reference to history: the radical transformation of human society and art from the Stone Age to the Bronze Age. As an alloy consisting primarily of copper, bronze starts out as reddish gold and weathers to a bluish green or brown. To become black, bronze requires human intervention; for millennia, bronze casters had applied chemicals to create a black patina over the surface of bronze statues. The word “black” in the title may also allude to the darker history of bronze in ancient times: the alloy facilitated the making of weapons. Beal, Graham W. J. Jim Dine: Five Themes. Minneapolis: Walker Art Center, 1984. Texts by Robert Creeley, Jim Dine, and Martin Friedman. Celant, Germano, and Clare Bell, eds. Jim Dine: Walking Memory, 1959–1969. New York: Guggenheim Museum, 1999. Texts by Clare Bell, Julia Blaut, Germano Celant, and Jim Dine. Dine, Jim. “A Statement.” In Michael Kirby, ed., Happenings: An Illustrated Anthology. New York: Dutton, 1965. Feinberg, Jean E. Jim Dine. New York: Abbeville Press, 1995. Gruen, John. “Jim Dine and the Life of Objects.” Art News 76 (September 1977): 38–42. Livingstone, Marco . Jim Dine: The Alchemy of Images. New York: Monacelli Press, 1998. Shapiro, David. Jim Dine: Painting What One Is. New York: Abrams, 1981. Swenson, Gene. “What is Pop Art? Answers from Eight Painters, Part I: Jim Dine.” Art News 62 (November 1963): 25, 61–62. Jim Dine is a painter and sculptor who grew up in Cincinnati, Ohio, where his family owned a hardware store. He often makes works of art that depict everyday objects, including tools. In this sculpture, he places everyday objects beside symbols of great works of art. In doing so, the artist may be telling us that he considers ordinary objects to be works of art too. What ordinary objects do you see in this sculpture? What other objects do you see? Do they depict something in history? How might this array of objects tell a story? Have your child choose a media of their preference (modeling clay, pen or pencil on paper, collage) and to try to replicate an object your child uses everyday (such as a toothbrush, a fork, or a pencil). Then, create objects from history (like a pyramid) and arrange them in a row. Tell a story about these objects and how they relate to one another. You can also make some of these objects much bigger or smaller than their real size. Ask how the change in size affects the way your child sees them. Point out the new things you notice about these objects. Jim Dine grew up in Cincinnati, Ohio, where his family owned a hardware store. Dine often depicts tools in his art. In this piece, Dine shows tools alongside several reproductions of famous works of art. When artists use existing objects in their work (as opposed to creating them originally), they are using a method called appropriation. Do you see familiar objects? Which objects did the artist make? Which were appropriated? Why do you think the artist placed his tools alongside the other objects? Create a collage that tells a story about your life. Use pictures from magazines or small objects and glue them to a new sheet of paper. Add your own drawings to the paper. Which parts are original, and which are appropriated? Jim Dine is a painter and sculptor working in a Pop Art style. Growing up, his family owned a hardware store, and so he often depicts tools in his works of art. Notice in this sculpture how Dine used symbolism. He placed symbols of tools, such as a hammer, alongside symbols of familiar works of art, like the Venus de Milo. The artist may be suggesting that the everyday tools of an artist can also be seen as historically valuable and visually pleasing. This approach is common in Pop art, which aims to make art more familiar and approachable by using everyday objects as symbols for greater meanings. What kind of objects do you see? What do these objects symbolize to you? Are some of these items familiar to you? Have you ever thought that everyday objects could be seen as art? How can we tell the difference between familiar objects of our daily lives and that of art? Is the artist challenging our idea of art? How might we begin to see the beauty of everyday objects and the purpose of art? Choose a tool that is used frequently in your home, such as a toothbrush, scissors, or something from the kitchen like a spatula. Make several drawings of it in different sizes using a variety of media, such as pen and pencil or paint. Compare your artworks to each other and to the original subject you chose. How does the change in size and media affect how you view the object? Does the object seem different to you now that you have taken it out of its original context? What new things do you notice about the object?